Adventurer, at the same time pianist, singer, composer, conductor author and actor, Gilles Ramade has made dispersion an art. His last show, Piano Furioso, is in his image: insolent, surprising, unclassifiable. It jostles academic codes and attacks the propriety of the classic. His meeting with Jérémy Ferrari was obvious. A crazy and hilarious show, masterfully led by a virtuoso sharing his passion between Bach, Ray Charles, Gainsbourg and many others ... All generations laugh with the maestro. Gilles Ramade made his reputation in France for his part in Andrew Lloyd Weber’s amazing musical Cats. Hard to pin down, he is a free, unclassifiable artist, both an actor and a musician. 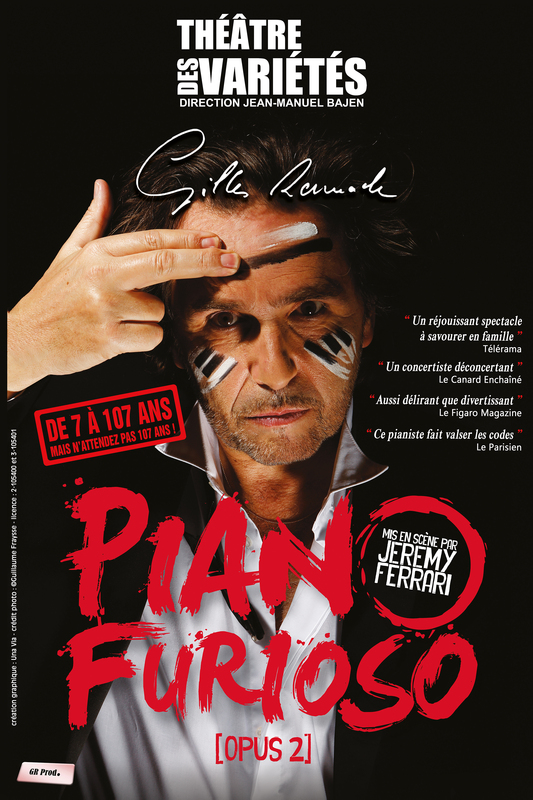 He has decided this year to give you an exclusive english version of his well-known show Piano Furioso, a show that has already been seen by over 20 000 people in France and abroad. Paying tribute to Victor Borge, whom he considers as one of the greatest musical humorist of his time, Gilles Ramade offers us this year an English version of the play, in which he will reread famous letters in which Elise is called Therese, play a concerto whose score is written on a blanket, and give us a hilarious impression of Ray Charles blindfolded. Taking us up in the midst of his chaotic pianist life, he will tell you stories about his very first piano teacher and the compulsory lessons of musical theory, describe the extraordinary evenings at the piano bar, disclose the secrets of famous pianists and take you through the strange codes of classical music… Whether you are a classical music lover, a curious enthusiast or just eager for music and laughter, you are all welcome to meet the great Maestro ! A hilarious show, led by a virtuoso pianist and a crazy showman.